L A Skin | Know your Birthmarks! A congenital, coloured spot on the skin is a birthmark. It is either usually present at birth or appears shortly there-after. The cause of most birthmarks is unknown and there are no preventive measures to avoid them. Birthmarks are discoloured spots which are completely harmless and, most of the time,are not of any serious concern. Mainly, they are of two types: (i) Pigmented birthmarks and (ii) Vascular birthmarks. (i) Pigmented Birthmarks are caused by an over-production of pigment in skin (such as Moles, Café-au-lait spots,Mongolian spots). 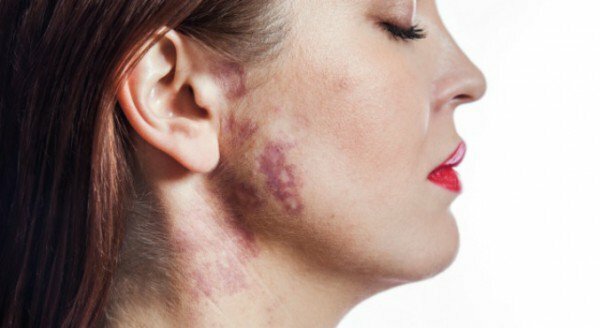 (ii)Vascular Birthmarks are caused by an overgrowth of blood vessels in the skin (such as Port wine stains, Haemangiomas, Stork bites). Most birthmarks are innocuous and need no serious attention. There are a few which disappear with time. However, there are some birthmarks that can mar your beauty, especially when they appear on the face or any other easily visible body part. Birthmarks rarely can be dangerous and be a cause of skin cancer. Therefore it is important to know the type of birthmark you have and how it can be removed! Salmon Patches: They are also termed as stork bites or angel kisses. They usually appear on the forehead, neck, eyelid or back of the neck. These are small blood vessels which are visible on the skin. Salmon patches are known to be harmless and fade away with time. However, if they persist and look unsightly, they can be treated with laser. Port Wine Stains: These are deep red to purple marks that become darker with time. These birthmarks are composed of malformed, dilated blood vessels in the skin. They appear on the face or limbs, and can be unsightly. Port wine birthmarks can be treated by laser therapy. Hemangiomas: These are reddish or bluish discolorations of the skin which are raised. They are small at birth and grow rapidly within the first few months of life. Most of them are harmless, and gradually shrink over time. However, if they are around the eye or the nose, they can interfere with sight and breathing. They can then be treated by laser by an expert dermatologist. Venous Malformations: Bigger and protruding blood vessel birthmarks which are tangles of abnormally formed veins. These birthmarks are very rare and refuse to fade away with time. One should always consult a dermatologist to get these treated. Nevus Sebaceous: These birthmarks may appear after birth on a baby’s scalp or face. They are hairless flat yellow plaques which deepen in colour over time. Nevus sebaceous is very rare and should be treated by removing surgically as it has a risk of developing into basal cell skin cancer. Nevus sebaceous is one of the few birthmarks that can be removed at an early age. Café-au-lait spots: These are flat, brown colored spots which can be present anywhere on the body. Usually they are around 0.5 to 2 cm in size and few in number. If several such spots are present, it can be a sign of a genetic disorder and the child should be shown to a dermatologist. These spots are usually harmless, but can be lightened with laser treatment. Mongolian spots: These flat, bluish-gray patches are found on the lower back or buttocks. They usually fade away as the child grows older. Moles: These are round, small brown or black in colour and can be flat or raised. Rarely they can be large in size known as Giant Melanocytic Naevus, and may have hair growing out of them. They need to be shown to a dermatologist to evaluate any risk of melanoma. Your dermatologist will suggest you the best treatment option out of surgery or laser to remove them if required. L A Skin and Aesthetic Clinic is one of the best Dermatology clinics in South Delhi that treats the different types of birthmarks. Our team has one of the best dermatologists who know and understand the risks involved with some birthmarks; and know the best way to treat them. Our dermatologists treat the various kind of birth marks with the most advanced and latest lasers, with superior results. Why to opt for laser hair removal?. Monsoon related skin and hair problems. All you want to know about lip augmentation!.